WMI (Windows Management Instrumentation) is the basic way of querying and changing basic information about any windows server, including SQL Server or Exchange Server. It provides a logical structure and representation of systems and services that are hosted on the server and is essential for anyone who is keen to automate routine monitoring and administration work via PowerShell, especially where many servers are involved in the task. CIM – Common Information Model. It is a set of standards that describes how information is structured and represented at the heart of the system. It was created by the DMTF (Distributed Management Task Force), a working group to which Microsoft belongs. 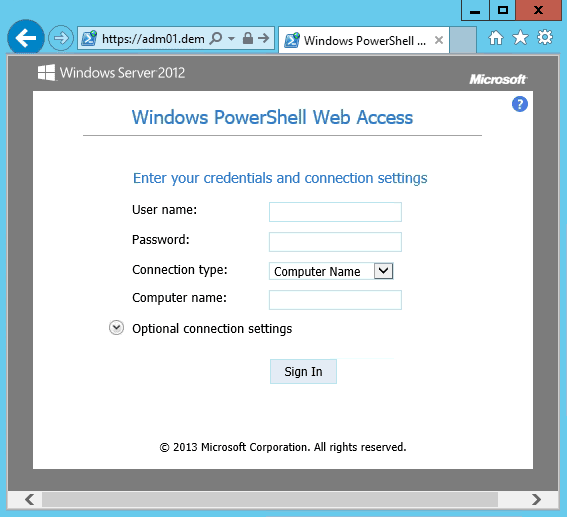 PSWA – PowerShell Web Access. This new function allows secure access to a Windows PowerShell console from a browser so as to interact with any system, even if it is outside the domain. These technologies are too broad in scope to describe in full here, but you will find numerous sources of documentation on the internet to help you understand them. The objective of this guide is to give you a preview of what is possible to do, but most of all to explain how they will be useful in your daily routine, whatever the type of Windows system administration you are doing. Let’s start with the oldest of these technologies – WMI. This is best envisaged as a database of all the information contained by the device, such as the discs, the services, or the BIOS. SQL Server, for example, is a WMI device. You will be able to gather a group of data and therefore recover the properties of a multitude of objects. You must understand that the operating system knows everything about your device (remaining disc space, IP address, means of consumer service most used …). So the first command that you will use to question your device is Get-WmiObject followed by WMI class. A lot of information is returned. On the left, we have the names of the classes, then the methods associated with each class of the namespace (by default: ROOT\cimv2). Note: You must have IIS Server installed to run the above query in the Namespace “root/MicrosoftIISv2”. Depending on the device that you are questioning, certain specific roles may be installed or not. That’s great because I can obtain lots of valuable information, but are they only in “read-only” mode? No way! It is definitely possible to alter some information. Let’s imagine the following example: you have just migrated your DNS servers that have a new IP address. What happens? You are obliged to modify the network configuration of all your servers. We are going to make use of the SetDNSServerSearchOrder method. My variable $wmi contains the network card activated on my server. PS> $wmi = Get-WmiObject win32_networkadapterconfiguration -filter "ipenabled = 'true'"
This command may be executed on remote devices. We shall see this in the following section. I can read and modify the WMI information as I wish, but I have to admit that it is still difficult to find it. 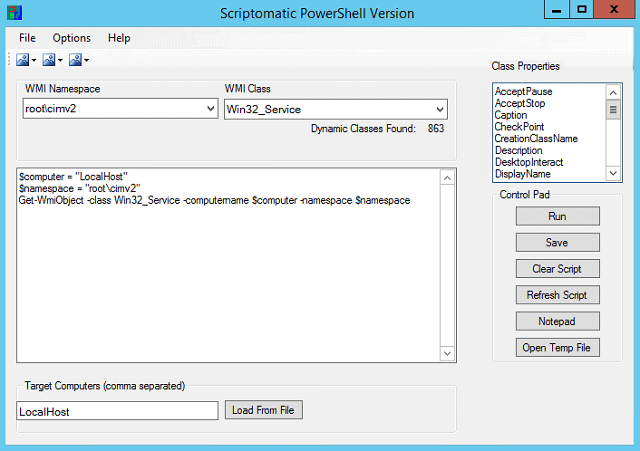 Fortunately, there is a great tool created by Ed Wilson that is called Scriptomatic Powershell Version. You can download it here. 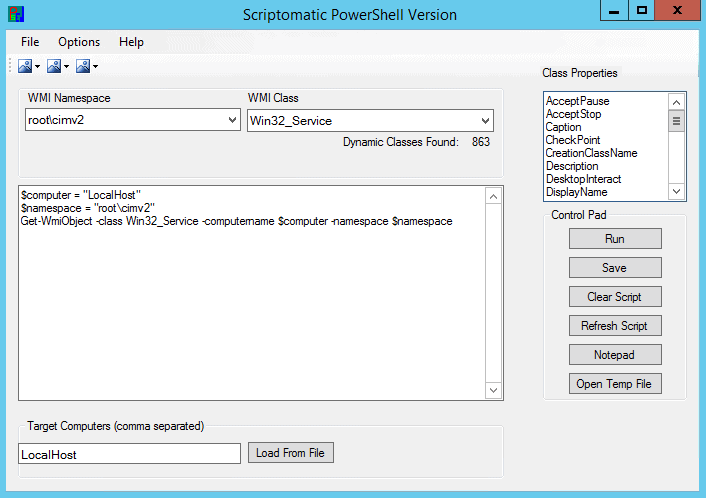 Once the tool is launched, all you need to do is to choose the namespace and then select a WMI class. Then, magic! The PowerShell command sets itself up automatically with all the necessary arguments in use. The “Run” button lets you execute the task directly. You will appreciate that this tool will simplify your daily admin work and save you a lot of search time. Since the third version of PowerShell, a new module has been introduced in Windows Server 2012 and Windows 8 that is called CIMCmdlets. It has been added so as to replace the legacy WMI cmdlets. If you regularly use WMI, then you will not be lost when moving to the new cmdlets as there are lots of similarities. Note: the “auto-completion” does not work with CIM session. WS-Management is a protocol of communication for the management of servers, equipment, and applications. CIM communicates, by default, through this protocol but it is possible to “force” another protocol in order to remotely access a device. We shall see this now. Note: The DCOM protocol is used by WMI. DCOM, the Distributed Component Object Model, allows communication between components, in contrast to CIM which uses WS-Man. We notice that our CIM session has been created with the DCOM protocol, in contrast with the previous session that used WSMAN by default. Note: For better visibility, the parameter –Name allows you to name your session. PS > Get-WmiObject -Class Win32_Service -filter "StartMode = 'Auto'"
When the parameter -filter is used, there is less demand place on your WMI repository and it therefore sends back the results more quickly because -Filter uses the WMI Query Language (WQL), which is a subset of SQL.With the “where” condition, results are filtered when retrieving the objects. In our example, the execution goes from 121 to 80 milliseconds. So, when you question a remote device with –filter parameter, your data passes through network in a shorter time-period. The network administrators will be happy to hear that. Certificate Authority (AD CS) will give you a certificate for the hosting server PowerShell Web Access. Note: I strongly advise against the option –UseTestCertificate. This automatically places a test certificate on the site. I highly recommend the use of a certificate signed by the certificate authority. Then you will need to add it in the “binding” section for the HTTPS protocol of your IIS site. The last stage consists of establishing authorisation rules. One must thereby define just one rule per server and per user. 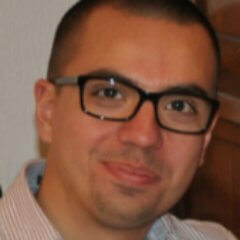 My advice is to use Active Directory groups to reduce the number of rules. The last parameter (–ConfigurationName) indicates the Endpoint PowerShell on the targeted system. By default, the Endpoint is “Microsoft.PowerShell”, but it is possible to create other specific Endpoint to limit modules or commands accessible by one user. 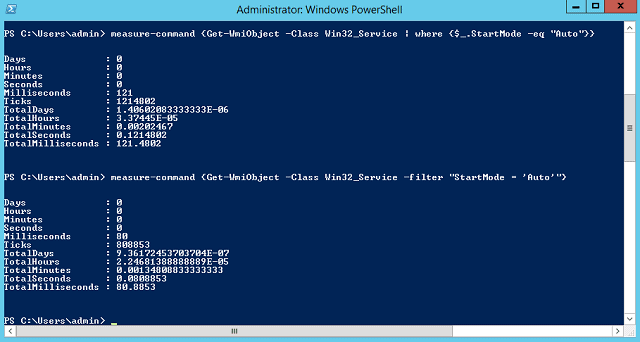 Below is the PowerShell console that you will get. 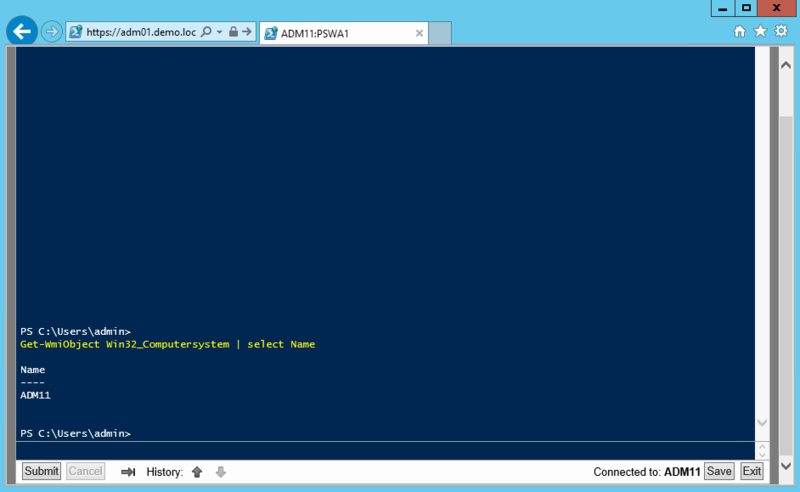 By sending a WMI command, I notice that I am connected to the PowerShell console of the server ADM11 from my gateway server ADM01. You may use this console from your smartphone or any other device that has a compatible browser. I shall let you imagine all the possibilities of this function for automating routine admin work in your daily life. We are coming to the end of this article which I hope will help you to automate some of the routine in your daily admin tasks. I’ve only been able to give an overview of some complex technologies and so there are numerous things to explore. To make sure you get a good start, I advise you to duplicate the examples of the article and adapt them to your daily routine. Then you will be able to improve and create them with some of the more complex functionality that you’ll find in the references I’ve given. 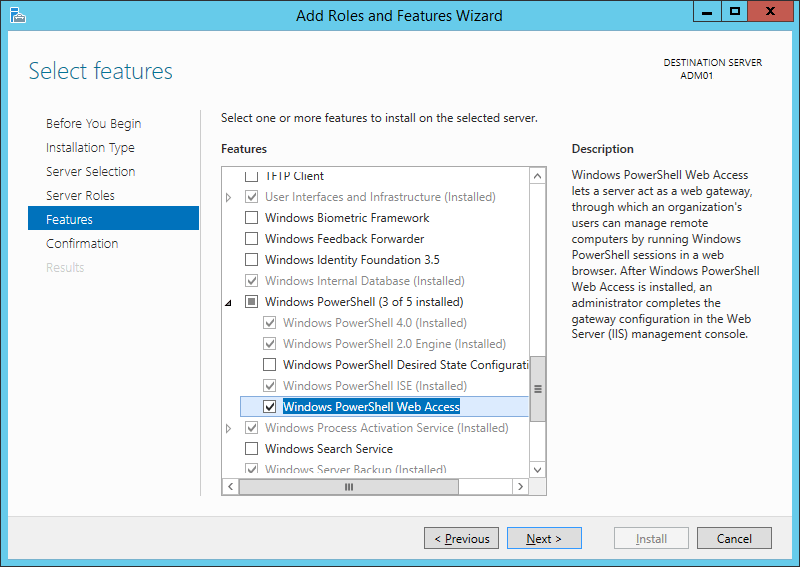 If the version of Powershell is v1 or v2 then use WMI. If the version of Powershell is v3 or above then use CIM. To go further and to link with what I demonstrated in the first part of this series, you may automate your WMI/CIM requests inside jobs and workflows. 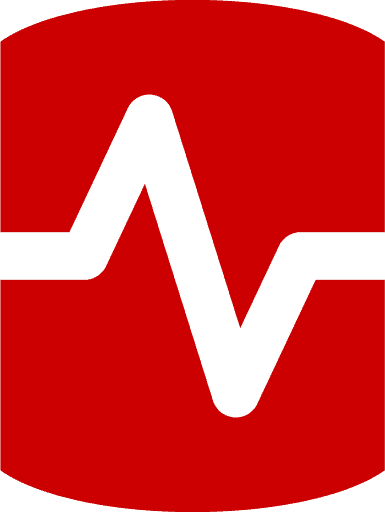 Do not hesitate to use Powershell resources to simplify your working life to the maximum. am new to Powershell and I read that powershell is mainly meant for automation . Can any one advise whether we can automate this report using power shell. Once the powershell script is created I wanted to schedule it on a remote server.